The Mobile Orchard is an inhabitable public art installation; a hymn to the urban fruit tree; a celebration of the 2013 theme set by its commissioners, the City of London Festival. 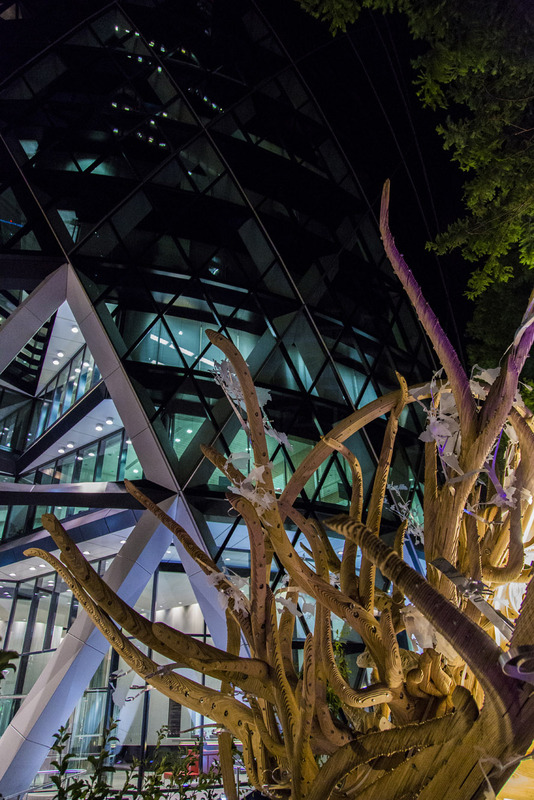 Its exuberant design mutates the wonder of natural trees with a structure ergonomically tailored to humans, offering a labyrinth of complex and inviting spaces that seek to nourish all the senses – celebrating both the formal structures of nature, and the social structures of cities. 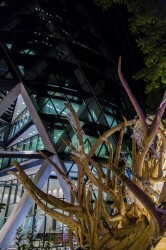 It previewed in Paternoster Square before commencing a weekly journey that stopped at Devonshire Square, the Gherkin, and Finsbury Avenue Square. The Mobile Orchard centres on a sculptural timber oasis that doubles as immersive summer street furniture – morphing into seating, shelter, stairway and sky-throne. Its undulating roots offer a landscape for lounging, including sinuous benches and a molten armchair that cradle the gaze upwards through the hollow trunk. Massive branches worm outwards from a dramatically leaning trunk to offer further seats, splaying to form steps that spiral upwards around the undulating trunk to a throne at the tip. 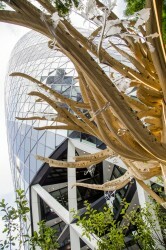 A lightweight latticework of curved and folded aluminium unfurls from the laminated plywood grains to support a canopy of lasercut leaves – each blade waste-lessly cut in the shape of a local London borough, with the host borough further subdivided into wards – the blossom and seeds of the project. The branches cradle a constellation of Braeburn apples, refreshed as quickly as the local City workers can pluck and eat them. 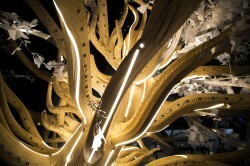 The trunk houses a miniature processor that illuminates its bark with glowing Xylem, waterproof LED veins uniting sky and soil, their sinuous lines graphically delineating the segments of the tree’s core geometry, each terminating in a glowing spot of LED moon-light. The man-made tree was donated to Trees for Cities, who plan to tour it across Britain for 5 years, while its attendant choir of young fruit trees have been donated to the City’s first orchard, and to a host of other local London schools to start their own orchards. 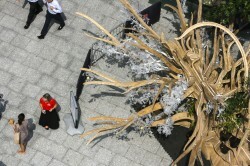 The Mobile Orchard was designed as a fluid freeform set of solids – each governed by a complex set of ergonomic, regulatory and geometric and fabricational constraints – that could then by auto-sliced, labelled and arrayed for simple CNC-cutting. Like trees, it has its peculiar grain – a radiating grid of 30-degree segments, each composed of parallel laminated slices of 4mm birch plywood, each bound and wound back to core central tree rings within the hollow trunk. 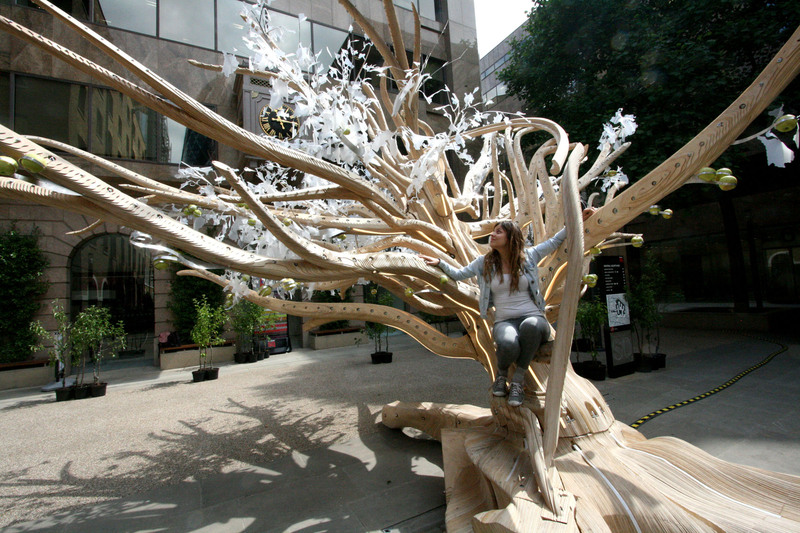 Every other segment worms out as an unduating root of public seating, converging in a sumptuous, ballasted trunk. 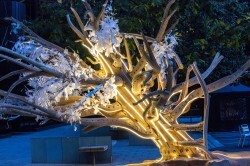 A family of 20 removable bifurcating branches tie into carefully-engineered slots winding up the trunk, bolted in and capped by a sinuous seam of LED lighting that runs in excavated grooves up the entire tree. Thin curved-folded lasercut aluminium secondary branches peel out from slots in the timber boughs to carry a canopy of ‘London Leaves’ – signs doubling as shading, cut with the zero-waste boundaries of local boroughs. 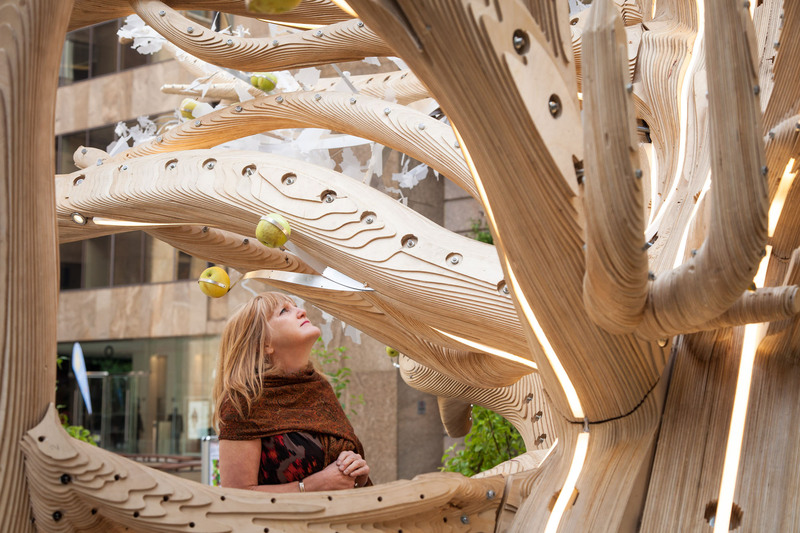 The design of the Mobile Orchard furthers atmos’s ongoing investigations of natural forms, organic structures, experiential ergonomics, digital fabrication, and innovative public landscapes. It was parametrically designed using scripts and algorithms that explore the mathematical rules of growth so brilliantly exemplified by nature, enabling an unprecedented level of highly-resolved complexity. In homage to the surfaces of its modernist host borough, the design originally proposed lightweight interlocking lasercut steel sheets, using curved folds to economically achieve large spans. The evolution on towards a plywood solution developed for reasons of both cost and comfort, offering a warmer and more welcoming series of surfaces for the public to enjoy; the design of the secondary branches retains the only trace of the original curved-fold sheet metal design. 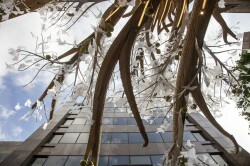 Though natural in form, the project is centrally about people and interaction, collectivity – and cities. Its forms ape humans, moulded to their bodies, mirroring their movements. 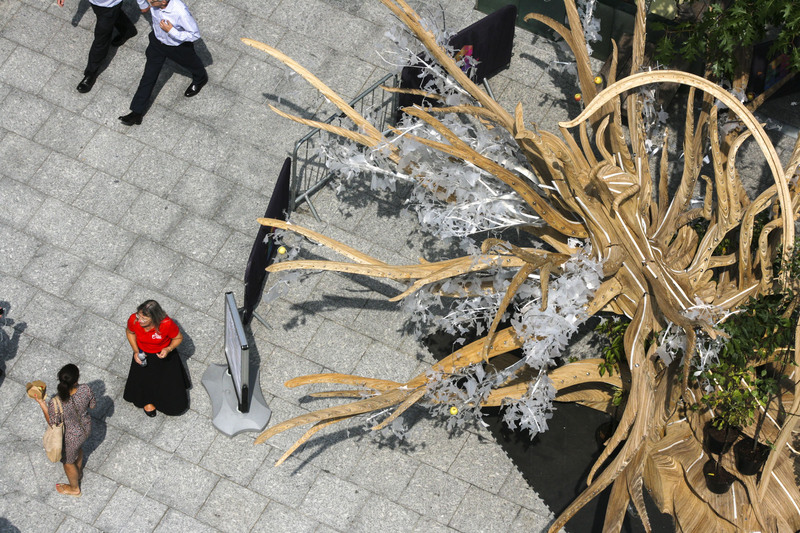 Its branches offer its visitors food, and hosted a range of eating events – a core interest of the studio, whose director created Latitudinal Cuisine and Global Feast for the Olympics, merging design with fine-dining in the aspiration to stimulate both mind and body. 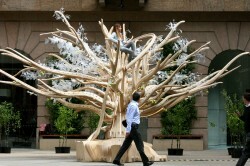 The Mobile Orchard is intended to challenge and inspire, to a offer a background that becomes a prop for the actor and player in all of us, and to encourage exploration and interaction. 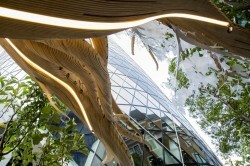 “This project was a unique opportunity for us to finally really grapple with the sculptural and complexity of trees. We’ve been designing projects that reference them – whether explicitly or unconsciously – for years, but never had the chance to deeply investigate and share the stage with them, until now. 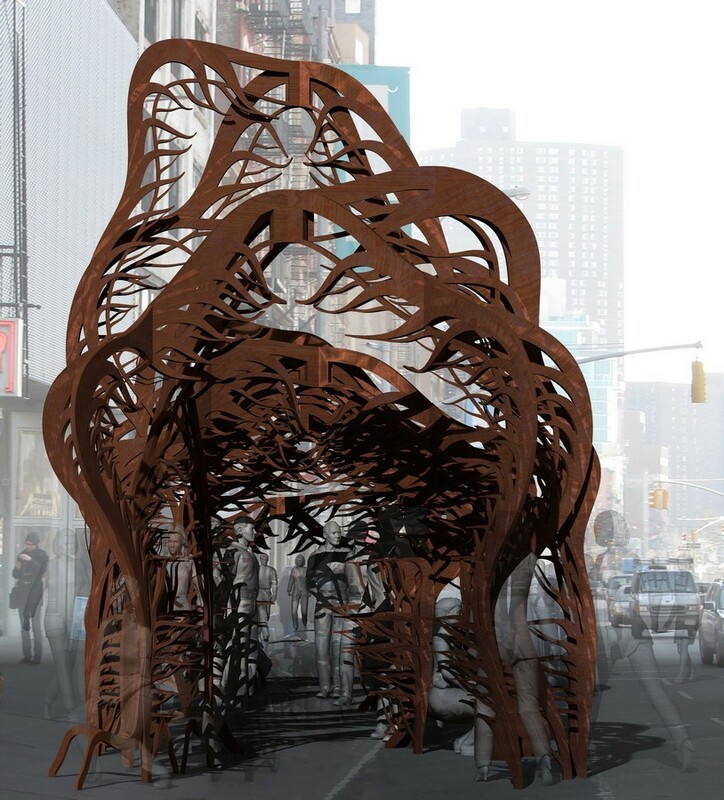 In an age of algorithms and emergent digital design, the complex growth patterns of nature’s closest thing to architecture demand inspection, investigation, and blustering forms of imitation, offering deep lessons in a wide array of architectural issues, spanning culture and technology. Every other segment worms out as an unduating root of public seating, converging in a sumptuous trunk base that contains 1.2kg of ballast to counter both live and dead loads on the cantilevering, spiralling trunk above. 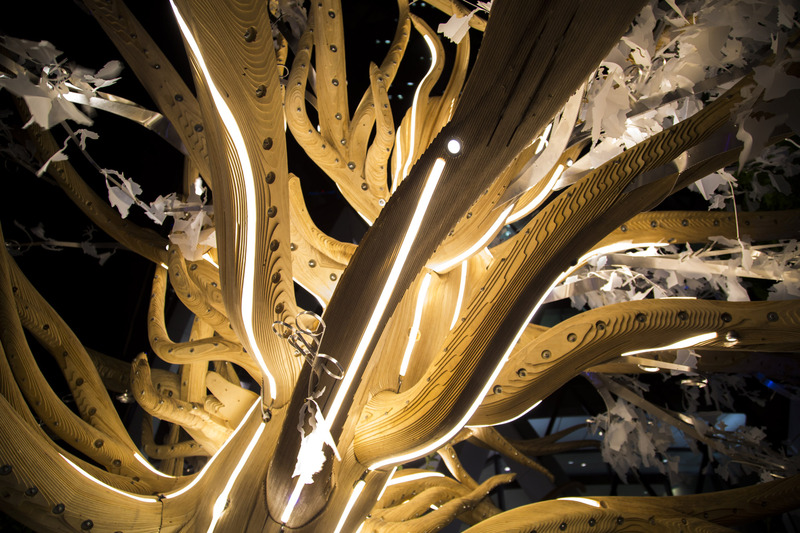 A family of 20 removable bifurcating branches tie into carefully-engineered double-chamfered slots winding up the trunk, wound in and bolted and then capped by a sinuous seam of LED lighting that runs in 16mm-wide excavated grooves up and over the entire tree. Thin folded lasercut aluminium secondary branches peel out from slots in the timber boughs to carry a canopy of ‘London Leaves’ – signs doubling as shading, cut with the zero-waste boundaries of local boroughs.